Long composite bows give this infantry an advantage in range and accuracy. They are capable of melee, but it would be a fool who uses them to attack an unbroken enemy. These infantry troops lack the speed and manoeuvrability of horse archers, instead relying on their powerful long composite bow. They are only lightly armoured with a quilted linen cuirass worn over a brightly embroidered long sleeved tunic. 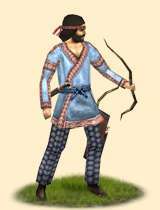 Trained from birth in the use of the deadly eastern composite bow, these men know their worth and are often to be found among the Parthian garrisons and in their field armies. Historically, the Persians may among nations undoubtedly be placed in the first rank of archers and the Marda Shivatir are their elite. They are recruited from the more settled elements of the Parthian tribal host in the core of the Parthian homeland and surrounding regions. It seems likely that at least some of these infantry were those of the Parthians too impoverished to afford to fight mounted, or those whose mounted skills had declined as a result of settled life to such an extent that it was no longer possible for them to serve in their traditional role.